Aviation of Japan 日本の航空史: Art McNitt's 1/32nd scale Kawasaki Ki-61-II Kai "Bubbletop"
Art McNitt's 1/32nd scale Kawasaki Ki-61-II Kai "Bubbletop"
Courtesy of Ken Glass come these images of Art McNitt's splendid 1/32nd scale model of the "Japanese Mustang" built from the Hasegawa kit with the Alley Cat Kawasaki Ki-61-II Kai Late Production Conversion resin set. Previously Art used another Alley Cat conversion set to produce a beautiful Ki-100 "bubbletop" here. The combination of Art's modelling and Ken's excellent photography showcase the superb lines of this rare but alluring fighter. It is a pity that its very limited operational use precludes much variety in the display of colour schemes and unit markings and this is probably the reason there are so few kits of the type. However there are always "what-if" projects that conceive engine reliability and manufacturing problems being overcome to make this a very formidable opponent for the USAAF Mustang. It would look superb in polished natural metal finish. Art's model is depicted in the markings of the 56th Sentai, formed at Taisho in March 1944 and the only unit known to have operated the type when it re-equipped with the Ki-61-II in May 1945. By that time as part of the static force developed from the Sei-Go Operation the 56th was part of the 11th Air Division in the Central Air Defence Sector together with the 5th, 55th and 246th Sentai. The 11th had been re-organised from the 18th Air Brigade when that command was reinforced following the increased intrusion activity into Japanese air space in June 1944. At that point the Osaka and Nagoya areas were designated a single defence area which was satisfactory for administrative arrangements but the Suzuka mountain range running between Osaka and Nagoya hindered effective air operations. Because of this and the number of critical targets in both areas a single Air Division could not provide adequate air defence and on 6 September 1944 the 23rd Air Brigade was formed at Komaki airfield. Although nominally part of the 11th Air Div the 23rd, formed around the 55th Sentai was given significant autonomy to conduct operations. Meanwhile, in August 1944 the 56th with 18 aircraft had transferred to Tachiarai in north-central Kyushu to operate with the 12th Air Division. Their zone of operations extended from Tachiarai to Omura airfield and depot near Nagasaki. From November 1944 they were based at Itami. From 14 May 1945 the 56th moved to the Naval airfield at Saeki in north-east Kyushu to conduct interceptions as part of the "gauntlet" operations against enemy formations using the Bungo channel approach. These operations lasted barely a week before the 56th returned to Itami via Ashiya to re-equip with the Ki-61-II. Thereafter they encountered intruding USAAF Mustangs for the first and last time on 9 July 1945. When the war ended the 56th were at Itami with 22 Ki-61 aircraft on strength. 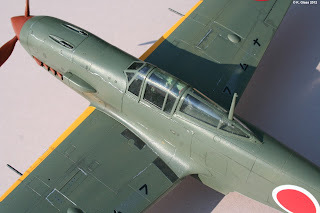 For 1/48th scale modellers there was a resin conversion kit for the Hasegawa Ki-61 made by Monochrome GK and available in Japan circa 2002 which consisted of new fuselage halves, prop, exhausts, supercharger intake, radiator fairing, rudder and a decal sheet for 56th Sentai options including full sets of numbers. Alas, I have not been able to confirm whether this conversion set is still available or a link for it. The 1/72nd releases of this unique fighter type were discussed here. This looks great! It must be a scale that requires a lot of focus and follow-through, and now along with your beautiful Ki-100, you have a couple of types that will be rare to see on the model tables at any show. And this one is "the ultimate Hien" to a lot who admire the type. Thanks for letting us see it. Great photography, and one more of so many contributions to this blog. Over many years, along with your own fine research you have lent encouragement and support to many in this fraternity, thanks. This 32nd scale build was not Art's first attempt at a Ki.61-II bubble top. Around ten years ago he made a conversion using Hasegawa's 48th scale Ki.61-I and bubble top Ki.100 kits. It came out well considering the amount of putty and sanding needed to match up the fuselage fit along the cut lines. Thanks for the history of the 56th Sentai's Ki.61 usage, Nick. Do you have any information saying the 55th Sentai got any Ki.61-IIs?